While it would be great if every reader of our blog read each post to the end, we know it’s unlikely. Attention spans are short and there is a lot of content out there. That’s why we write in the inverted pyramid style. It quickly sums up information for readers. They’ve gotten the gist of your piece no matter when they decide to click away. 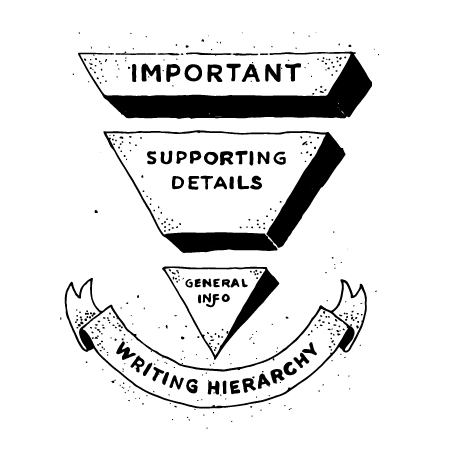 The inverted pyramid writing style places the most important information at the beginning. Other details and nice-to-know facts are filled in later. In this blog post we’ll discuss what the inverted pyramid is, why and how we use it, and how you can use it for your own written works. The inverted pyramid is familiar to newsreaders. Journalists put their crucial facts at the beginning of their article. From there, they fill in their piece with other information and details. This method is good for blogs and other types of writing, too. A reader can stop at any time. This is different from, say, narrative longform journalism. It hooks the reader with small details and buries information throughout to keep them reading. For our blog, we like the inverted pyramid because it quickly relays information. While we’d love for all of our readers to finish each article, we understand that their attention span is currently shorter than that of a goldfish. So it’s okay and understandable if they don’t. They’ve gleaned plenty of information by the time they’ve decided to look away. Wondering if it’s right for you? It probably is. The internet is awash with great content. The inverted pyramid ensures that your readers get something out of your content, even if they click away too soon. Do what we do: start out with a catchy lede and explain briefly what you’ll be talking about in your writing. Then get to it, starting with the most crucial information. For this piece, we thought the reader should know what the inverted pyramid is and why we like it. If they dig that, they’ll learn a bit more, including how to use it for their own writing. We think everyone should read this far into this post, but we understand that plenty of readers won’t. So we write with the inverted pyramid method—those flighty readers will get almost as much out of this piece as those who made it to the end. Want more fresh content like this? Sign up for our newsletter Orange Slices.